Some words just sting a little bit harder when you’re trying to conceive…especially if those words imply that there’s only one successful outcome. Today we’re talking about why words like “promoted” and “graduated” can be so damn hurtful in the context of trying to conceive. About a year ago, I saw a kitschy t-shirt being sold at a gift shop and the entire event stuck with me. I pictured a 27-year-old girl naively buying the shirt after a successful 8-week ultrasound, then wrapping it up and giving it to her mom on Christmas. I pictured her husband filming the reaction and then sharing it on social media. I pictured all the comments and hated that this experience was something that my husband and I would never have. Even if we miraculously got pregnant, it’d never be with the cockeyed optimism that this fictitious character I’d invented had. And I hated her for that. I also hated her mom. But mostly, I hated that stupid shirt. I spent a few hours stewing over this shirt, fluctuating between being mad at its sheer existence and then being mad at myself for letting something so dumb affect me so deeply. But the more I thought about it, the more I realized that maybe I wasn’t wrong to be upset by the words on that shirt. 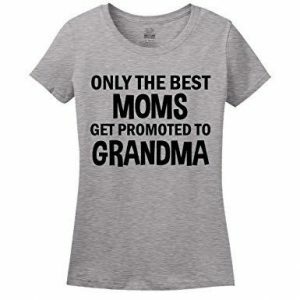 Maybe that specific phrase, “promoted to grandma” is inherently hurtful and demeaning. The word “promoted” quite literally means “to advance in rank, dignity or position.” This means that the shirt isn’t just some quirky way of saying the wearer is a grandparent. It’s also saying that she is inherently more valuable or worthy than people who are not grandparents. THIS. This is why I was so upset. I also didn’t love the first part of the shirt. “Only the best moms…” which make it sound like there is a direct correlation between the quality of a parent and their likelihood to become a grandparent, which uhhh…..we all know is ridiculously false. I’ve always felt uncomfortable with this phrasing. Like the word “promoted,” the word “graduated” means success, advancement and achievement…which implies that anyone who hasn’t “graduated” from their fertility clinic is a failure. Is less than. Or worse…hasn’t “earned it” the way this person has. Anyone who has gone through fertility treatments knows that you can’t study your way to a positive pregnancy test. You can’t train for an egg retrieval. So much of what happens after an IUI or round of IVF is based on a random combination of luck, biology, genes and meds. Sure, we like to think it’s some secret combination of eating pineapple core and taking the right vitamins and removing gluten, but more often than not…it’s completely out of our hands. We need to be careful with the words we use surrounding our fertility and our personal outcomes. Implying that someone is inherently more valuable or successful than a fellow TTC sister is hurtful…and can make those still waiting feel even worse. There will always be missteps. There will always be hurt and pain when TTC. Some of this pain will be totally valid and some of it will be hormonal overreactions (I specialize in the latter). But it’s our responsibility as fellow TTC warriors and humans to do what we can to make others in our community feel worthy, seen, heard and loved regardless of their individual outcomes. What do you think? Do words like “promoted” and “graduated” bother you, too? Am I just being oversensitive?